Our Staff is made up of professional, friendly, and hardworking individuals. All which pride themselves on working together to satisfy customer needs in a timely manner without sacrificing the quality of work being provided. Our crew leaders are all BPI (Building Performance Institute/Building Analyst Professional) and RRP (Lead Based Paint Repair, Renovation and Painting) certified. All members of our crew have a number of other weatherization related certifications. Our goal is for you to get more for your money on top of never ending savings you will accumulate with our energy saving measures. The cost of energy is at an all time high, act fast! Give us a call today, we’ll be there tomorrow for a FREE estimate! Are you always cold in the winter or hot in the summer while in your home? Do you feel drafts throughout your home? Not sure how to fix it without spending an arm and a leg? 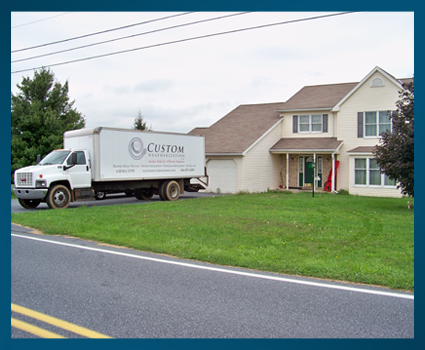 Custom Weatherization, LLC is here to make that happen for you! Custom Weatherization, LLC is a quickly growing company that was started in 2006 and has been providing energy efficient services to both residential and commercial properties ever since. We provide service and expertise on the following; installation and removal of insulation, air sealing, draft testing, appliance testing, repair and installation of water heaters/solar water heaters/water heater heat pumps and much much more! We work with and are registered providers for reputable companies such as PP&L and Met Ed. We also work among other weatherization programs in a number of different counties. We have great knowledge of all code and inspection requirements in the State!